David Lloyd George was a towering figure in British Politics during the first three decades of the Twentieth Century. He was a key figure in the extension of the British Welfare State and was Prime Minister in the last two years of the First World War. 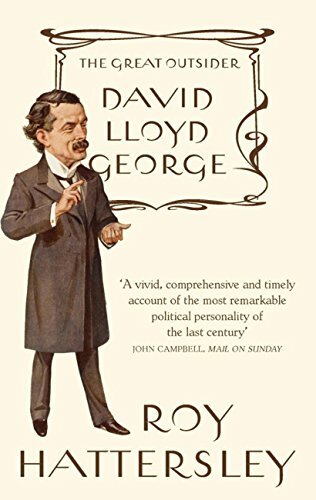 David Lloyd George was born in Manchester, to a modest Welsh farming family in 1863. He was ethnically Welsh and considered Welsh to be his first language. At an early age, his family returned to Wales and his father took up farming in his native Pembrokeshire. However, his father died of pneumonia when he was still young, and thereafter his uncle played a crucial role in encouraging David to take up law and Politics. Influenced by his childhood poverty and family atmosphere of Liberal politics, David Lloyd George was attracted to joining the Liberal Party, though he briefly flirted with the Welsh independence party. On 13 April 1890, he narrowly won a by-election in Caernarfon Boroughs to become the House of Commons youngest MP. As MP, he was interested in the disestablishment of the Church of England, temperance reform and Welsh Home rule. He wrote frequently for liberal publications such as the Manchester Guardian and maintained his law practice to provide an income. Lloyd George gained a national reputation for opposing the government’s intervention in the Second Boer War. He argued the government claims to be extending suffrage to the Boers was misleading (when the UK itself didn’t have universal suffrage). He claimed the motives for the war were profiteering and financial. He particularly attacked Prime Minister Chamberlain. This issue split the Liberal party between an Imperial wing (e.g. Asquith) and a non-Imperial wing. 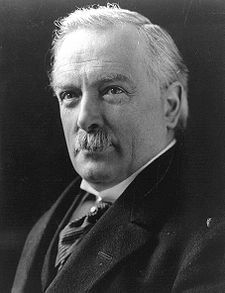 His growing reputation led to Campbell-Bannerman offering Lloyd George a Cabinet position as President of Board of Trade. He was influential in encouraging the recognition of Trades unions and helped to avert a rail strike through his meditation. In 1908, he was promoted to Chancellor of the Exchequer. This gave him an opportunity to extend the welfare state – adding unemployment benefits and sickness benefits. This was an important extension from Asquith’s old age pensions. These benefits became colloquially known as a ‘Lloyd George’. In his budget speech of 29 April 1909, Lloyd George passionately spoke of his hope to reduce poverty. In 1909, he also sought to fulfil the Liberal manifesto to reduce government spending on military expenditure – However, conservative forces hotly fought against these cuts and in the end, Britain continued with its arms race, which proved to be a contributory factor in the build-up to the First World War. Despite Lloyd George’s opposition to the Second Boer War and military spending, he unequivocally supported Britain’s entry into the war against Germany. In particular, he saw the invasion of neutral Belgium as a great wrong. By 1916, Prime Minister Asquith was becoming increasingly unpopular. Many felt he lacked the qualities of a real war leader, and so in 1916, Lloyd George was invited to be the Prime Minister of a National Coalition. Lloyd George immediately began reforming the War effort creating a daily War Cabinet meeting. He put in place many new initiatives such as rationing and national planning for munitions. He proved a very able war leader but was critical of generals such as Douglas Haig. His later war memoirs helped to cement the popular notion of ‘lions led by donkeys’. Despite being a war leader, he indicates he was moved by the plight of those having to actually fight. In 1919, Lloyd George was also Britain’s representative at the Treaty of Versailles. Lloyd George wanted Germany to pay substantial reparations. But, unlike the French (under Clemenceau) he didn’t want to bankrupt Germany totally. He saw Germany as an important trading partner and felt it would be dangerous to bankrupt German industry. Nevertheless, he pressed for significant amounts of reparations. For this, the economist, John Maynard Keynes criticised Lloyd George for his short-sightedness in sowing the seeds of future conflict. He said of Lloyd George, in his Economic Consequences of the Peace. “Not badly, considering I was seated between Jesus Christ (Woodrow Wilson) and Napoleon (Clemanceau)”. The End of the First World War witnessed profound social and political changes. As Prime Minister, Lloyd George oversaw a significant extension of the vote to women and all men. It was also a period where Labour became more organised both economically and politically. In 1922, his national coalition broke down as the Conservatives became increasingly suspicious of Lloyd George. This was based on scandals (such as his involvement in the selling of peerages) and his liberal tendencies. In 1922, the Conservatives fought the election on their own and won under Andrew Bonar Law. On leaving number 10, Lloyd George remained an important figurehead in British Politics; his opinion carried weight, though he never regained office. In 1936, he met Hitler and commented favourably on Hitler and some of his policies. However, he soon became worried over Hitler’s intentions and began to support Churchill’s view of the need to re-arm and face the threat of Hitler. However, in 1940, after the Battle of Britain, Lloyd George feared Britain’s ability to survive and in a letter, suggested Britain should sue for peace with Hitler. Lloyd George passed away in 1945 from cancer, aged 82. Citation: Pettinger, Tejvan. “Biography David Lloyd George“, Oxford, UK. www.biographyonline.net. Published 11th February 2013. Last updated 16 February 2018. Famous Welsh People – Welsh people including Owain Glyndwr – the first Prince of Wales, Nye Bevan, David Lloyd George and Catherine Zeta-Jones.